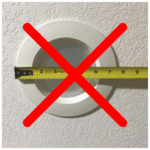 Recessed lights are categorized by their size. The most common residential sizes are 3-inch, 4-inch, 5-inch and 6-inch.This leads to the common question; "What is this size is actually referring to?" The answer is it's the size of the inside diameter of the housing (aka "can") with the trim or LED module removed. A common mistake is to measure the outside of the trim which will give you a larger (inaccurate) reading. Measure across the opening of the inside of the housing at the widest point. Housings sizes can vary a little between manufacturers, but they should measure close to a whole number - either 3", 4", 5", or 6". Many LED Retrofit modules come in 5/6-inch size which means they have an adjustment that allows them to fit either 5-inch or 6-inch housings.